We mentioned in a post late last year that a consultation was being carried out into Initial Teacher Training and hope that many of you had an opportunity to contribute. 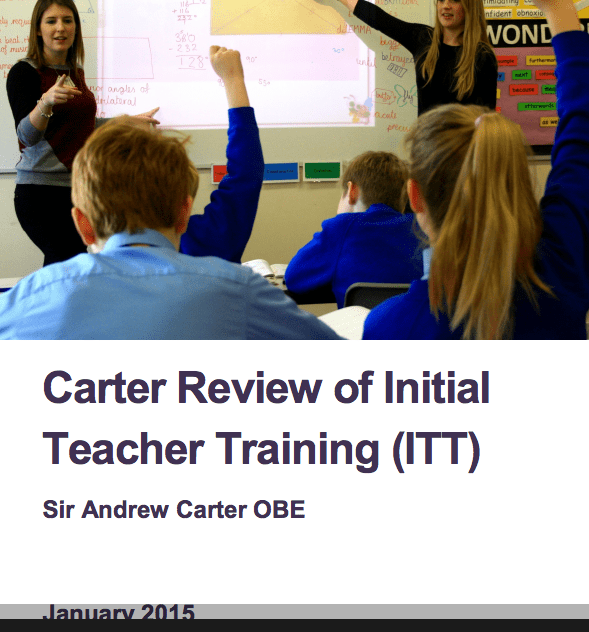 The report, the Carter Review of Initial Teacher Training (ITT) headed by Sir Andrew Carter OBE has now been published and contains specific recommendations regarding training for teaching children and young people with special educational needs and disabilities. 2.3.41. All teachers are potentially teachers of SEND. This is highlighted in the new SEND Code of Practice (DfE, 2014b). As such, it is critical that all new teachers are given training in how to support children with SEND – this should not be treated as an optional extra but as a priority. We believe understanding how to teach children with SEND is critical to improving progress and achievement for all children. The recommendations stress the importance of evidence-based teaching and effective progress assessment for all children saying, "Being able to assess pupil progress effectively is crucial to good teaching." 1e: Child and adolescent development should be included within a framework for ITT content. The report says that behaviour management should be prioritised within ITT programmes with providers building in opportunities for trainees to learn from a range of outstanding teachers, with a specific focus on managing pupil behaviour. It says, "We have found that the most effective programmes are practically focussed and underpinned by deeper understanding of behavioural issues. We believe it is crucial that trainees receive practical advice - tangible strategies for new teachers, grounded in evidence. All ITT programmes, for example, should support teachers to develop their own classroom presence and cover use of voice, body language and how to develop classroom routines and defuse situations." It is important that new teachers are equipped to teach in ways that enable the large majority of pupils to learn essential curriculum content, build on this and keep up with the taught curriculum. Effective differentiation does not mean having several different lesson plans for one class. New teachers should be skilled in careful design and skilled delivery of teaching so that all pupils can access and secure the concepts being taught. Additionally, new teachers should have a sound grasp of practical strategies to enable lower achieving pupils to address critical gaps, make quick progress and keep up. There are two recommendations - one main and one sub-clause that relate specifically to SEND in the report. Recommendation 1g in full: : Special educational needs and disabilities should be included in a framework for ITT content. This should prepare all new teachers to support SEND in their classrooms, providing a solid grounding in the most pertinent issues and setting an expectation for on-going high quality professional development. structured placements for trainees in special schools and mainstream schools with specialist resourced provision – ideally, trainees should have opportunities for assessed placements. The review notes the importance of ITT recognising that good teaching for SEND is good teaching for all children. ITT should introduce trainees to the most common issues they will encounter and practical strategies for addressing these. There should be an emphasis on instilling a clear expectation of on-going development. Trainees should be introduced to multi-agency working as well as how to work with a range of colleagues and professionals, as well as parents and carers, to support children with SEND. Well-planned experience in specialist settings allows trainees a significant opportunity to learn about a range of needs and observe specialists in action. Throughout this review, organisations have raised concerns with us about how ITT inadequately prepares new teachers to address special educational needs and disabilities. We acknowledge that it can be challenging to address SEND within ITT programmes, particularly those that are one-year long. However, we feel there is too much variability across the system in what is covered in SEND. I note with interest in the quote above that it says "Trainees should be introduced to how to work with a range of colleagues and professionals, as well as parents and carers, to support children with SEND." To me, this is clear acknowledgement of the central role parent carers have in the team around each child with SEND and a recognition of the new SEND Code of Practice's statement, that parents know their children best and that the EHCP process involves parents and young people at its heart. Of interest as a note at the end, the review mentions that: The National College for Teaching and Leadership (NCTL) has recently commissioned a small scale pilot of test and learn projects with a focus on increasing knowledge around Special Educational Needs and Disabilities (SEND) in ITT within the current framework of the Teacher Standards and the ITT Criteria. These are school-led projects that will be delivered by Teaching School partnerships that have already identified themselves as having a lead focus on SEND. Are you a teaching professional? What do you think of the review's recommendations? Are you a parent? Do you think the SEND recommendations go far enough? Do you think they will be implemented? SEND reform feedback needed! We’ll give it directly to the Minister. Thanks for the email about this. Having read the report, I have to say that I am very disappointed that the NAS weren’t consulted. While autism is mentioned a couple of times, I fear we have a long way to go before schools or even teachers will be convinced by the need to make appropriate provision and adjustments to meet all the needs of these pupils while ITT will not offer more than a few hours teaching about how the condition impacts upon the ability to function of the individual. The future continues to be bleak for pupils with AS and HFA. Indeed, by omission, it is set to get worse for them. What about teachers already in post? Will there be any requirement for them to have SEND training?